As Tom says, 90% of life is turning up. For the past week we’ve been pushing ahead by referring to maps and as much following our instincts. The alternative is to sit, plan, discuss, debate, decide and then get lost anyway. Dwight Eisenhower said, “plans are useless, but planning is indispensable.” In life things on the ground are often different enough that you have to fall back on preparatory research, of which we have plenty, in order to move forward. We looked at the map, made the calculations and agreed that we’d head due north from Constanta instead of heading inland and zig-zag our way to the Romanian border with Moldova and on to the Ukraine. We bumped into a couple of other rally cars that went the long way around and ended up where we were in about the same length of time - but at least we had managed to see the wind farms, gigantic salt marshes, storks, and take a ferry ride across the mouth of the Danube for 21 Lei. Feeling positive, we pulled up at the border and shortcut our way into the EU line where the very friendly guards reviewed our papers and waved us through. 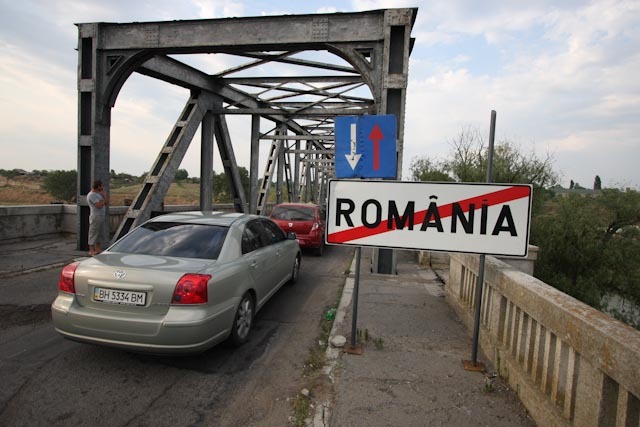 Crossing the bridge into Moldova an argument broke out between a Russian and a border guard. So vehement was their exchange that we sneaked up 10 car lengths and wormed our way in ahead of the non-EU passport holders. Not that it did us any good. Swifty’s title, the so-called V5, hadn’t come back from Swansea by the time Mike left for the Continent. Furthermore our savior, Jim, was the registered keeper of the car for tax and insurance purposes. All things combined we turned up at the Moldovan border with an old V5, no letter of authorization (with a stamp, gotta have a stamp) and no Green Card showing proof of insurance outside the EU. The V5 we suspected might be an issue, the authorization was obvious and something we should have predicted, and the Green Card was, let’s just say, a lack of research. The Moldovans were clear: incomplete paperwork, no crossing the country (a 30 minute drive). But they were very nice - reminding us that Moldova wasn’t part of the EU and, no, there is no way to get to Ukraine without going through Moldova. We were presented with a souvenir “Refusal of Crossing of the State Border by Foreign Citizens” and told by the customs agent, to “have a nice trip.” Back on the Romanian side we orbited Galati for a hotel for the weekend and called Jim for help. Meanwhile, we started planning all the things we’d have to do on Monday when the shops opened up.